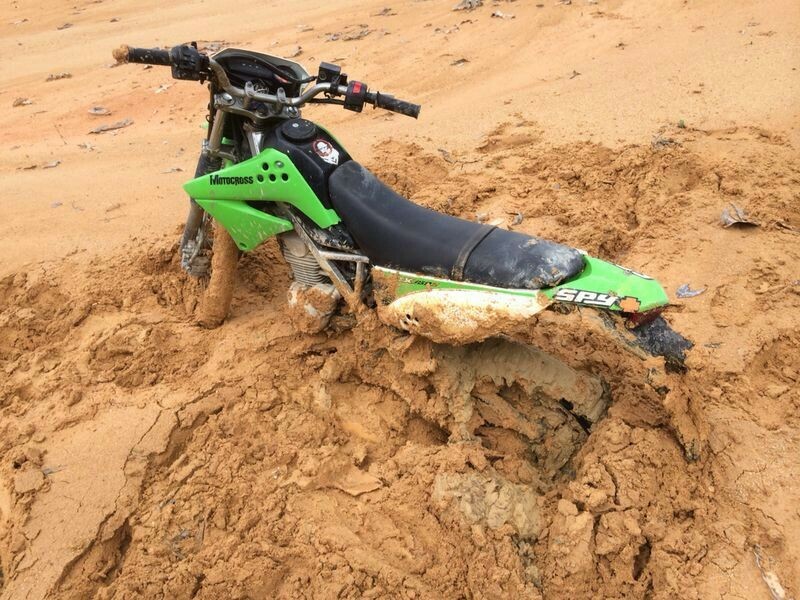 Friend’s bike stuck in soft mud. What do you do when you get stuck? When the going starts to get hard? When things start to fall off the rails of your well laid plans? Do you bail and look for an easy way out? Start getting frustrated and look for things to blame? Wish that someone/something can come along to solve all the problems for you? Well, I’m all of the above I realized. 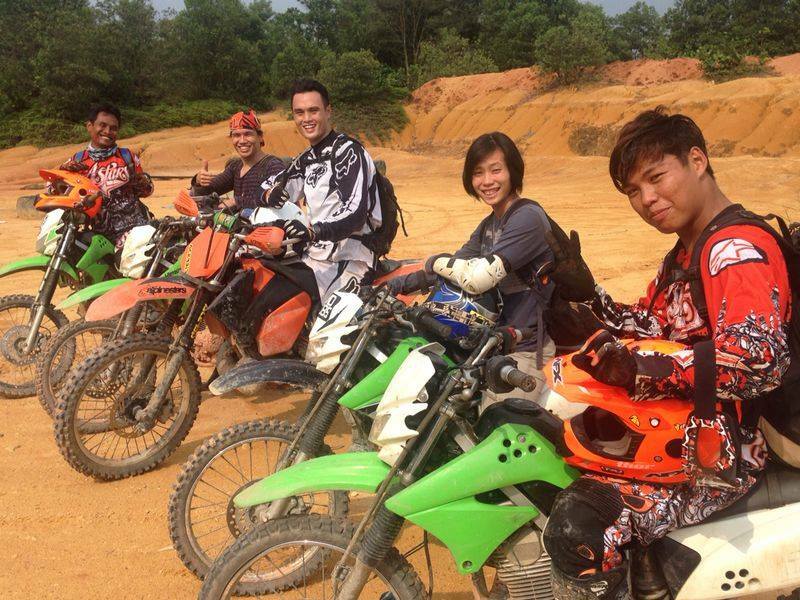 Last Saturday I was back out in Gelang Petah offroad riding. Tried the KTM 200 this time, a 2 stroke 200cc engine scrambler which was much more powerful than the KLX150 that I went on the past few times. Main reason was that the KLX was just too small for me and the riding position really didn’t fit me at all, but the jump to the KTM is a big one and seeing how some of my other friends struggled with it in the past I was hesitant to make the jump. The bike fit me well but soon into the ride I realized a big problem, the engine idle was very low, which meant it would stall even with the clutch is pulled in if you didn’t keep revving the engine. And when it stalled, the kick starting began. Without an electric starter, kick starting the KTM soon took a toll on me as each time to get the engine started it took several kicks, and with it constantly stalling, I was pretty much just struggling with starting the bike for the first part of our journey. And soon it got worst as I felt pain in my right ankle from the kick starting, somehow the way I was doing it was putting tremendous stress on the ankle and it quickly felt as if I sprained it, with each subsequent kick hurting more, resulting in me fearing to kick hard that further complicated trying to start the KTM. One of the thoughts running through my head was to swap the bike with one of our guides and take his KLX instead. Everything will then be solved and this kickstart/stalling problem would go away. But I won’t learn to conquer riding KTM scramblers or to learn how to manage bikes with similar problems. And that’s when I caught myself with my old thinking habits of trying to run away from problems. The bike was not going to change (at least not whilst I was in the middle of the jungle halfway into a trip), the only thing that was adaptable was me. I had to change. So I tried different ways of kick starting, different angles and speed which I applied force and moved the position of my foot on the kick starter to my heel rather than having it on my midfoot, and found that by doing it that way and kicking in a diagonally backwards direction, I was able to kick hard without hurting my ankle and at the end of the kick my foot would slide off the kick starter and have no “kick-back” by the starter that was hurting my foot massively. Success rate of starting the engine went up exponentially, problem 1 solved. Then I adapted the way I used the clutch and throttle to prevent the engine from stalling even at low speeds, key was the keep the engine rev high enough to prevent it from stalling at idle. By the end of the day, I was so happy on the KTM I knew I was probably never going out on the KLX again cause it simply didn’t fit me. And I guess this lesson learnt does not just stop at motorcycling, but in the way I have been facing life. Thinking back so many times when things got a little harder, I kinda just bailed and look where it’s gotten me. Now I finally understand, and more importantly been able to actually do, to stop running away from being stuck and the feeling of stuckness. For that is only a temporal state which one has to go through before figuring out what that has not been figured out yet. Getting stuck is a process of getting unstuck. The only way you can never be stuck is to always remain in your comfort zones and stay well within your own boundaries of previous experience and competences. But if you don’t push your boundaries of what you do, you’ll never reach the places you haven’t been or do the things you haven’t done before. All these reminded me of a scene from The Long Way Round (what inspired me to start riding motorbikes), when things got really tough for them in Mongolia, I’ve attached the link below.